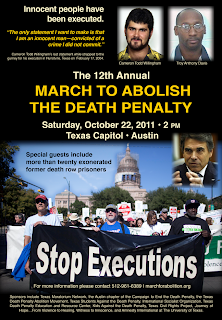 The 12th Annual March to Abolish the Death Penalty is Saturday, October 22nd, 2011 at the Texas Capitol at 2 PM (on the north side of the capitol). Special guests this year include 25 death row survivors who each spent many years on death row despite being innocent. Texas has executed 475 people since 1982 (as of Sept 23, 2011). Under current Texas Governor Rick Perry, 236 people have been executed, including some with a strong case of innocence. Twelve people have been exonerated while on death row in Texas, the most recent being Anthony Graves in 2010.Since 1976, there have been 138 death row exonerations in the United States. 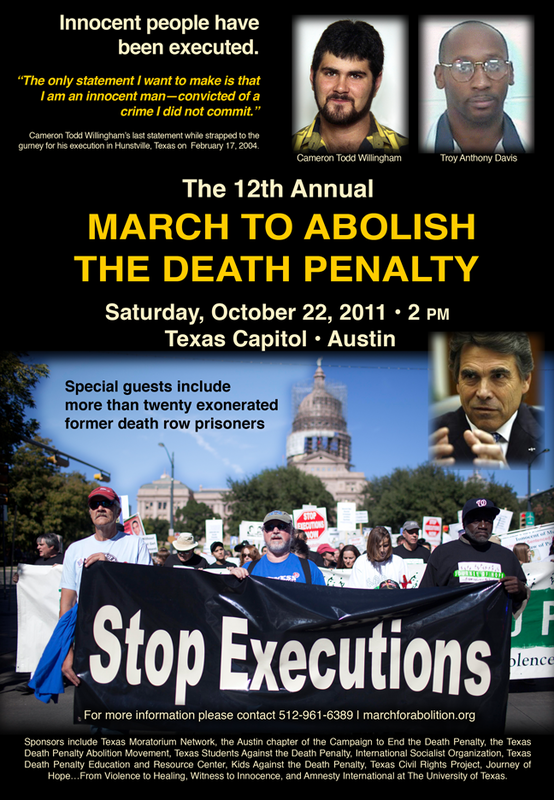 “We will be urging all Texans to join us at the March to Abolish the Death Penalty on October 22 in Austin”, said Ron Keine, formerly on death row in New Mexico. “As they see what the death penalty really means, in my case and others, more and more Texans believe that Texas can do without the death penalty,” said exonerated death row survivor Clarence Brandley, from Conroe, Texas, who has been fighting for compensation from the state of Texas for over twenty years. Each October since 2000, people from all walks of life and all parts of Texas, the U.S. and other countries have taken a day out of their year and gathered in Austin to raise their voices together and loudly express their opposition to the death penalty. The march is a coming together of activists, family members of people on death row, community leaders, exonerated former death row prisoners and all those calling for repeal of the Texas death penalty. The annual march is organized as a joint project by several Texas anti-death penalty organizations: Texas Moratorium Network, the Austin chapter of the Campaign to End the Death Penalty, the Texas Death Penalty Abolition Movement, Texas Students Against the Death Penalty, Witness to Innocence, Texas Civil Rights Project, International Socialist Organization, Amnesty International at The University of Texas, Texas Death Penalty Education and Resource Center and Kids Against the Death Penalty.